LOOKS GREAT AT NIGHT AND WORKS JUST LIKE A NIGHT LIGHT!! Do-it-yourself installation and both the flexibility of 7 day programming and the convenienceof automatic sunset/sunrise activation. Professional installation also available by licensed contractor. Programs are protected against a power failure by a pre-installed battery in the factory. Additional features include an LCD that shows the time, day and load status. The Aube 7-Day, 40-500W Timer is also available in white. Turn your lights on when it gets dark out with the 500-watt Aube Solar Time Switch or 1800-watt Aube Solar Time Switch, which use your city's coordinates to determine the sunset and sunrise each day, adjusting automatically as the year passes. Automatic daylight savings – no need to reprogram ever. on during the day when you are away, and give the home a random lived in look at night! Don't come home to a dark ever again. Protect your house by giving your home a lived in look even when you are away with the computerised random program schedule. . Program your lights to turn on automatically at specific times with the Aube 7-Day, 40-500W Timer, an attractive light switch that will replace any standard Decora-style switch. 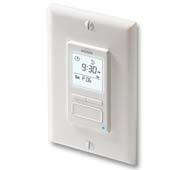 The backlit timer switch can control incandescent, halogen or fluorescent lighting. Easily record up to seven separate on and off sequences, which can be programmed daily or weekly. Need to turn on the lights on or off quickly late at night? No problem: The Aube 7-Day, 40-500W Timer offers a manual override, which enables the load to be turned on and off without affecting the programming by a push of a button. A Decora-style wall plate is sold separately or can be used with any existing Decora plate.